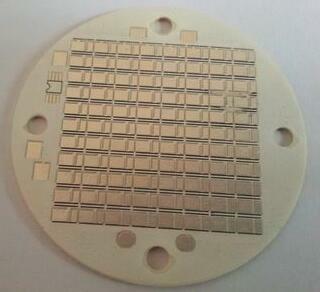 Aluminum Nitride (AlN) PCB is currently the best ceramic substrate material available. thanks to its high thermal conductivity (170 W/mK) combined with a high dielectric strength and low expansion (CTE) it is already widely used as a substrate or package for high power LEDs, IC’s, sensors and other components. Circuits can either be printed using Copper (Cu) or Silver (Ag) depending on the application and the request. Copper is offered both in DBC/DPC as well as Thick film screen print processes while silver can only be done in using the second manufacturing option. Today we are only able to manufacture single or double layer designs.